Dromclough NS Hurling Team in jubilant mood, having won their Allianz Cumann na mBunscoil Final against Scoil Mhic Easmainn, in Austin Stack Park. 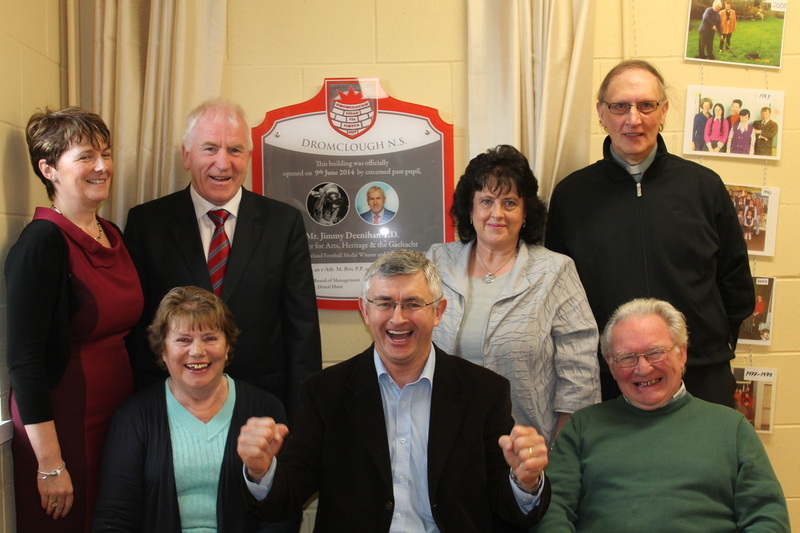 Members of the Board of Management at the opening of the new building at Dromclough NS on Monday 9th June 2014 by past pupil Minister Jimmy Deenihan TD. Dromclough NS pupils represent St. Senan’s GAA Ballad Group who were runners up in the County Finals of Scor na bPaisti in Ballybunion 13th April 2014. Pupils from 4th, 5th & 6th classes sang at the Peace Proms Concert in the INEC on Sunday 9th February 2014. They performed eight songs altogether, including Dance Evolution, Superhits, World In Union, One World In Harmony and the ever popular Muppets Medley. This is our third successive year taking part in the Peace Proms Concert. All the pupils loved the unique opportunity of performing with the Cross Border Orchestra of Ireland, under the baton of Mr Gearóid Grant. There was a memorable event at the end of the concert when our pupils proudly hoisted the school banner as Minister for Arts, Heritage & the Gaeltacht, Mr Jimmy Deenihan said he was delighted that pupils from his alma mater Dromclough NS were present in the Peace Proms choir. 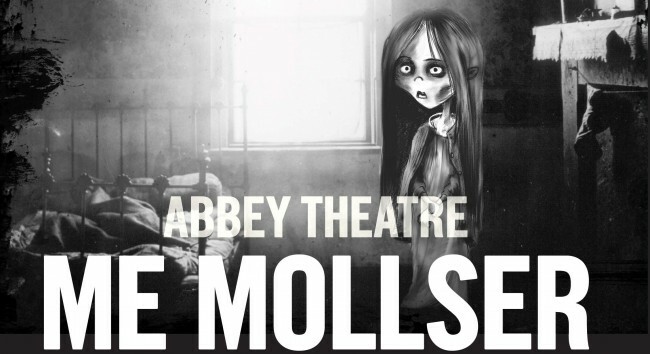 5th & 6th class pupils had the unique experience of attending the Abbey Theatre production of ‘Me, Mollser’ in Siamsa Tíre. This drama is based on the character of ‘Mollser’, a fifteen year old who appears in The Plough and the Stars by Sean O’Casey. ‘Mollser’ lived in the Dublin tenements of 1915 and suffered from TB. ‘Mollser’ interacted with the pupils on stage and they gained an invaluable historical and social insight into life in Dublin at that time, post-1913 Lock Out and pre-1916 Easter Rising. 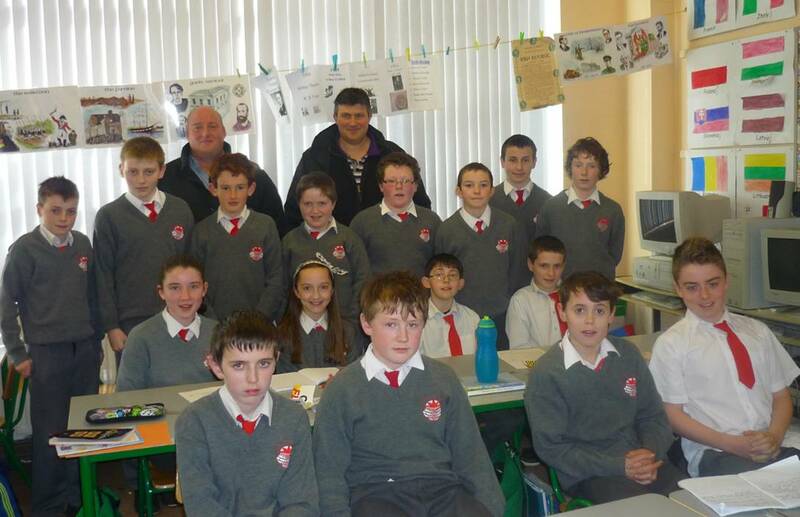 Local business entrepreneurs and Dromclough NS past pupils, Colm Whelan and Vincent Kelliher of Listowel Transport visited the 6th class pupils. We thank Colm and Vincent for the great insight they gave the pupils into what’s involved in setting up and running their own successful business, Listowel Transport. Mrs. Trench & Ms. Harmon receiving First Prize for the Best Overall School at the Writers’ Week Dan Keane Memorial Poetry Competition for Primary Schools on Sun. from Gabriel Fitzmaurice. 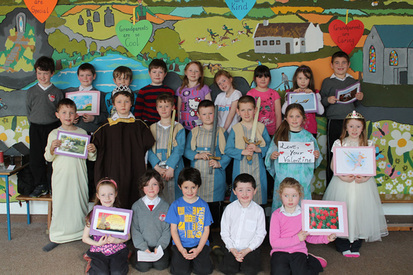 March 2013 - 1st class in Dromclough NS who dramatised the story of St. Valentine for the school. 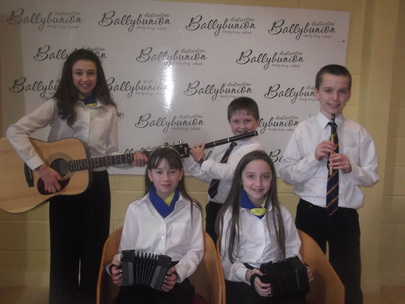 February 2013- Pupils from Dromclough NS who represented St. Senan’s GAA Club in Scór na bPáistí in Ballybunion last Sunday 24th February 2013. The club received the trophy for Overall Best Club, winning first place in Music Group, Ballad Group, Quiz & Figure Dancing. They received second place in Solo Singing, Recitation & Novelty Act. 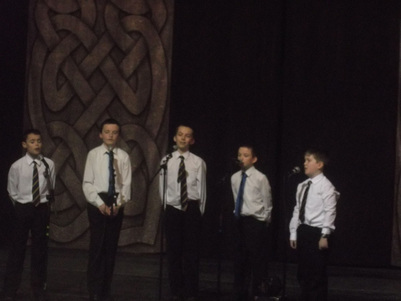 February 2013 - St. Senan’s Ballad Group, performing at the North Kerry Final of Scór na bPáistí in Ballybunion last Sun 24th February 2013. They came first place. 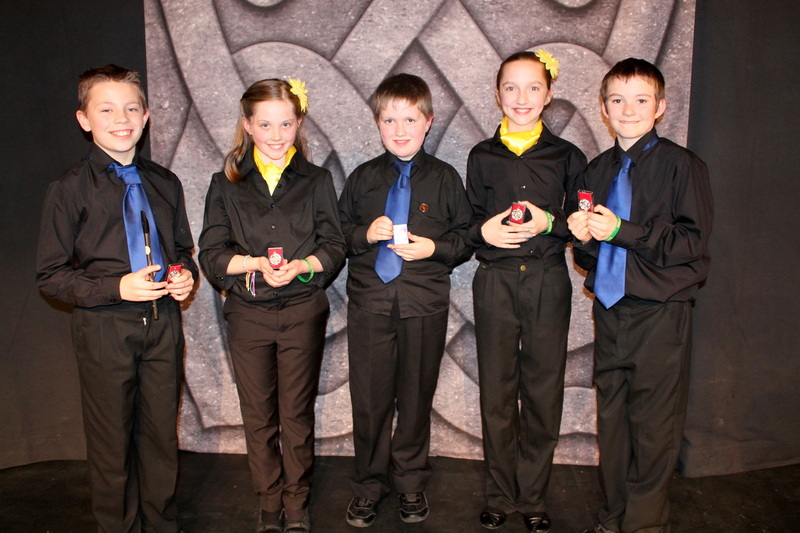 February 2013 - St. Senan’s Music Group, who came first in the North Kerry Final of Scór na bPáistí in Ballybunion last Sunday 24th February 2013. 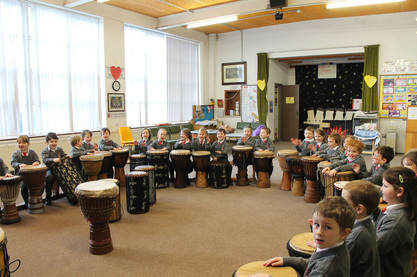 February 2013 - Pupils from 4th class at Dromclough NS found the recent drumming workshop great fun. 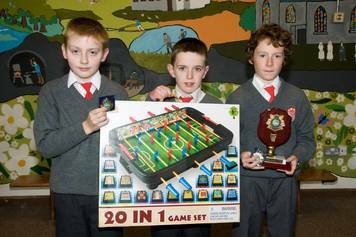 February 2013 - Boys from Dromclough NS who won prizes in Listowel Community Games on Monday night 4th February 2013. 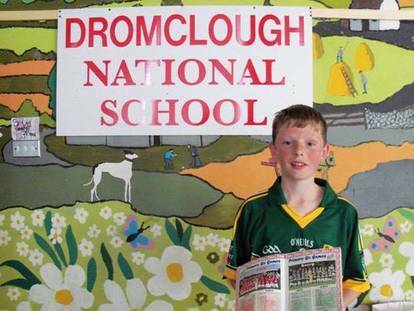 February 2013 - Best of luck, from all at Dromclough NS, to our past pupil, Gearoid Galvin, who is performing in the final of the Scór na nÓg Recitation Competition in Derry on Sat. 23rd Feb.
January 2013 - 5th class pupils at Dromclough NS, who raised €550 for Our Lady’s Hospital for Sick Children, by selling their own hand-made Christmas cards, which were much admired. 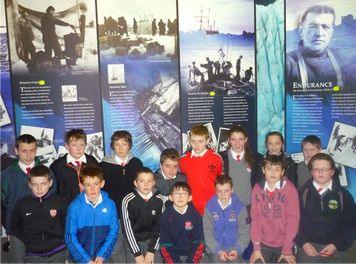 The class were directed in this venture by their class teacher Mrs. Breda Carmody. Pupils from Dromclough NS take part in the Cross Border Orchestra of Ireland Peace Proms Concert in Limerick. 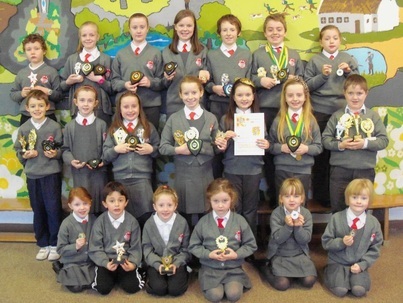 November 2012 - Pupils from Dromclough NS who took part in The Jimmy Hickey School of Dancing Feis last Sunday in Abbeyfeale proudly display the trophies and medals won by them there. 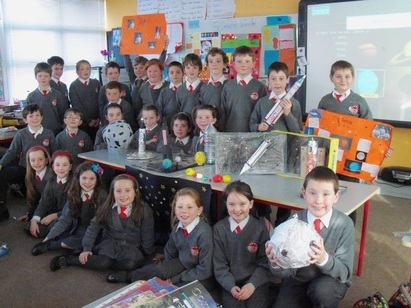 Ms. Harmon’s Rang 3 from Dromclough NS with the projects they compiled for Science Week. 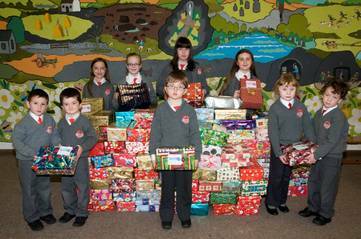 Pupils from Dromclough NS with over 100 Christmas Boxes which have been donated by the parents and pupils to Team Hope for redistribution to deserving children in Eastern Europe. 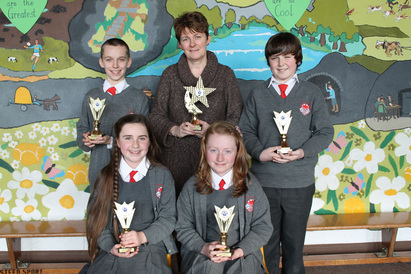 Front (L to R): Katie Trant, Saoirse White, Eabha Trant, Sean Spink. 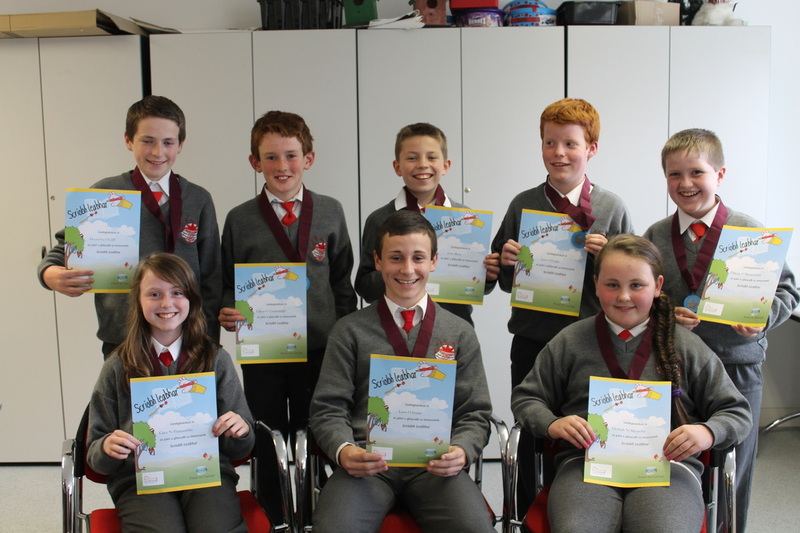 Middle (L to R): Daniel Hunt, Conor Walsh, Clodagh Murphy, Kalin Foley, Aisling Leahy, Conor Enright, Sarah Porter. Back (L to R): David Quinlan, Ruth Moore, Bobby Gale, Ciara O’Regan & Donal Lyons. 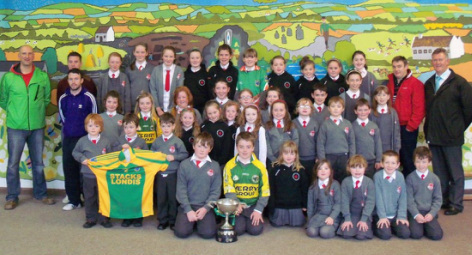 Dromclough NS who are members of Finuge GAA Club and Finuge/St. Senan’s Ladies Football Club with the Chairman of the Finuge Club, Mr. Denis McElligott & players who brought the cup to the school this week to celebrate Finuge’s recent win of the County Intermediate Club Football Championship. 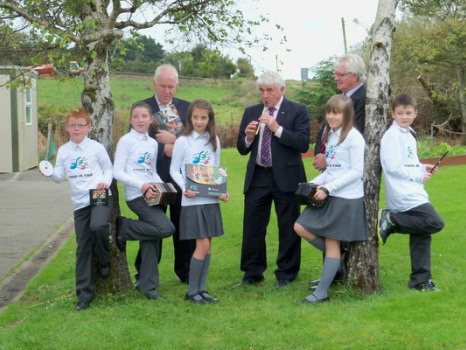 October 2012 - Launch of the Comhaltas Ceoltoiri Eireann “Trad is Fab” DVD & Teaching Manual by Minister Jimmy Deenihan, TD, which took place in Dromclough NS Fri. 5th Oct.
Front L to R: Liam Quilter, Dervla Cronin, Ava Holly, Elena McElligott, Michael Kelleher. 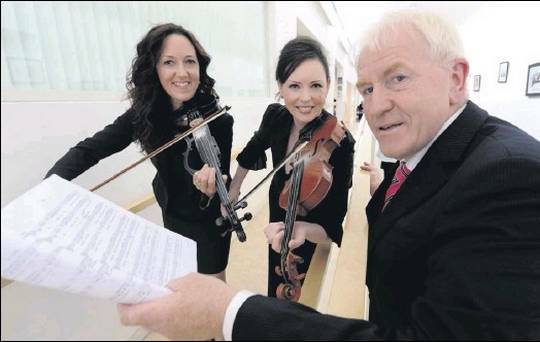 Back L to R: Minister Deenihan TD, Seamus MacCormaic (CCE), Tomas O Maoldomhnaigh (CCE). 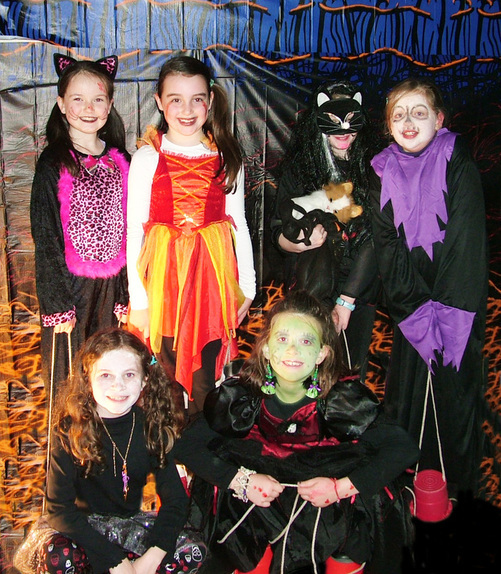 October 2012 - The Halloween Party, organised by the Parents Association, was again a great success. For the second year the halls of St. Senans were filled to the rafters! See our special photo gallery for an impression of the night! 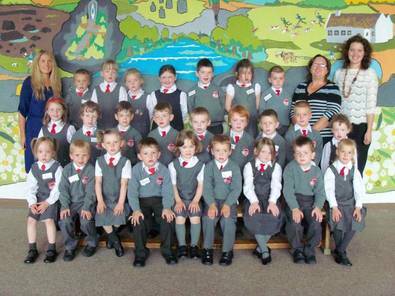 Junior Infant class 2012, Dromclough NS, with their teachers Mrs. O’Connell, Ms. Lyons and Mrs. Kathleen Quinn (SNA) - September 2012. June 2012 - Sean Galvin, Dromclough NS, who was selected to play for the Kerry Primary Schools Team at half time in Pairc Ui Chaoimh last Sun at the Cork v. Kerry match. Minister Jimmy Deenihan TD presenting a cheque from The Irish American Partnership to Dromclough NS for the Irish Rural Primary School Library & Science Programme. 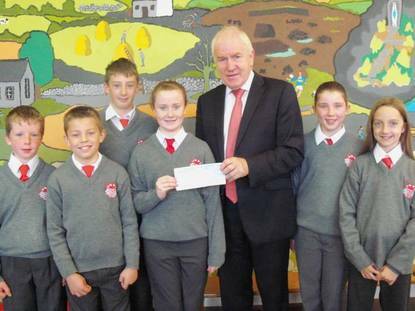 Receiving the cheque on behalf of the pupils are: (L to R) Seamus Stack, Liam Roos, Devan McKenna, Rachel McKenna, Dervla Cronin & Erin Healy. 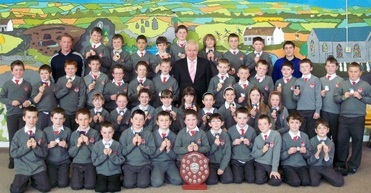 Pupils from Dromclough NS who were presented with medals by Minister for Arts, Heritage and the Gaeltacht, Jimmy Deenihan TD, at the Scríobh Leabhar 2012 prize-giving in the Education Centre, Tralee on Monday 28 May 2012. 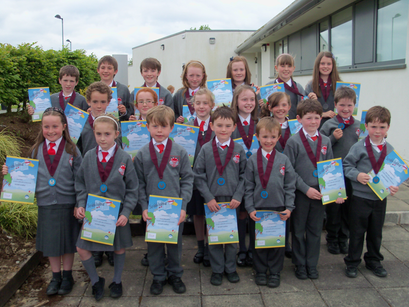 May 2012 - Pupils from Dromclough NS won medals in the national finals of the Community Games in Athlone last weekend. Front L to R.: Ciara Galvin, Máire Trant & Róisín McElligott, who got 2nd place in the Project; Pádraig Enright (Recitation), Aoibhe Linnane (Handwriting), Dónal Hunt (Cross- country running), Elena McElligott (Culture Corner). 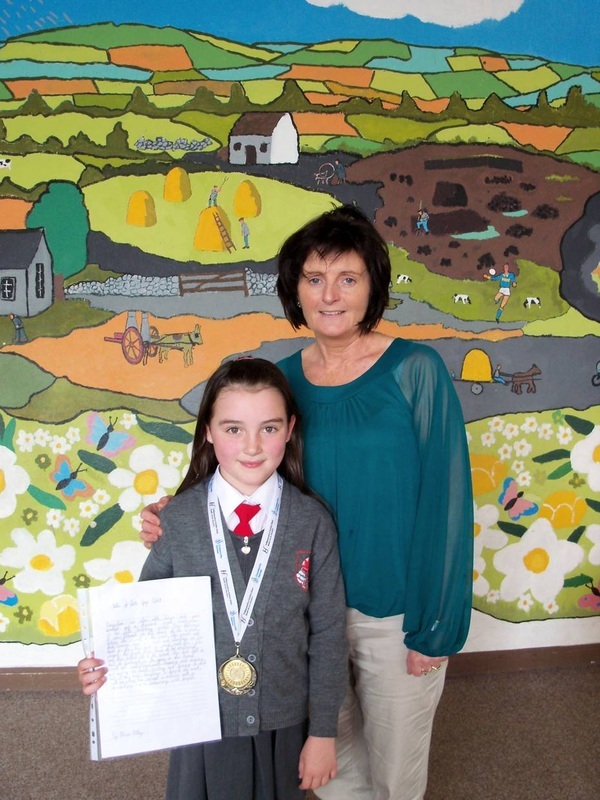 And Aoibhe Linnane, Dromclough NS, who won 4th place in the National Finals of the Community Games Handwriting Competition & her teacher, Mrs. M. Foran. 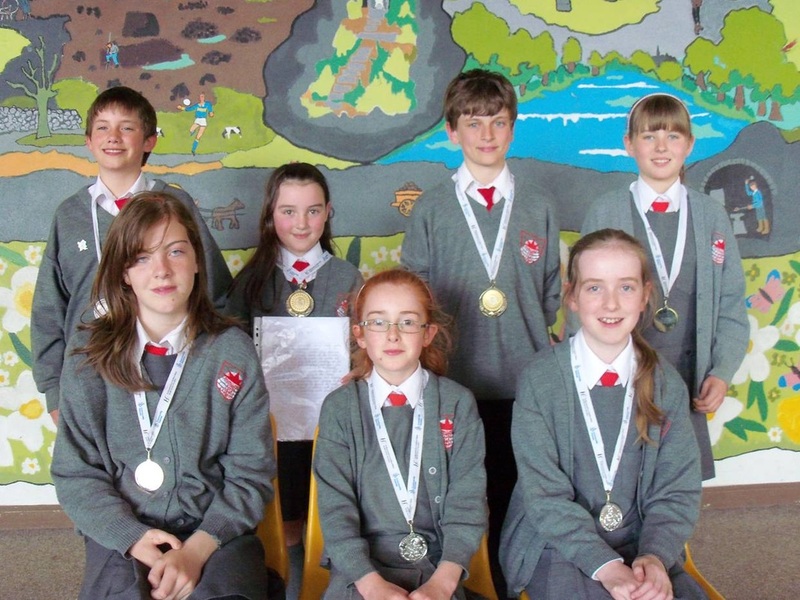 Dromclough Sprint & Relay Team win medals! 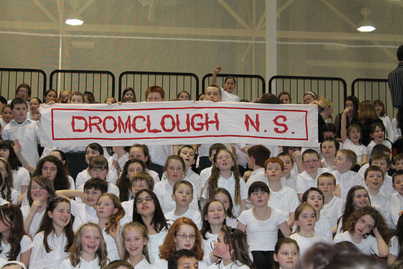 Dromclough N.S. 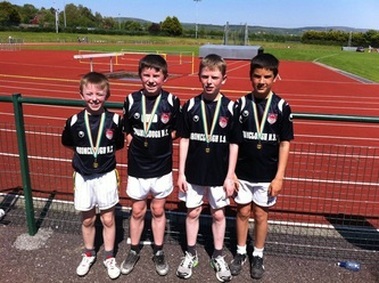 5th/6th class relay team who won bronze on sat 26th may 2012 in the 4*100 metre relay in the Kerry primary school sports in An Riocht track in Castleisland. The team from left to right are: Paraic Shanahan, Eamon Shanahan, Sean Galvin & Damian Larkin. Also on the team was Donal Hunt (not in picture). And also Megan Lynch in 1st class - unfortunately no picture - won a bronze medal in the 60m sprint. Ice-cream parlour in the school!! 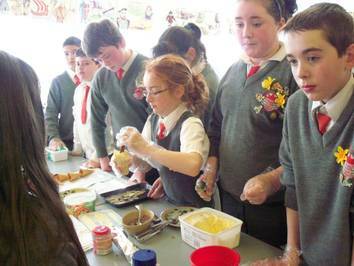 This year’s Junior Entrepreneur Project the 6th class at Dromclough NS ran an ice-cream parlour in the school on 27th and 28th March. A great success also due to the fine weather! More foto's in the photo/video gallery! 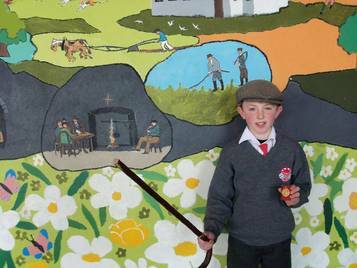 Páraic Shanahan(5th class), Dromclough NS who won the gold medal for Aithriseoireacht (Storytelling) in the recent County Finals of Scór. Páraic represented Crotta O’Neill’s GAA Club. Dromclough National School first class at the prize-giving in Dublin Castle for the Seat Belt Sherriff Competition. last week. 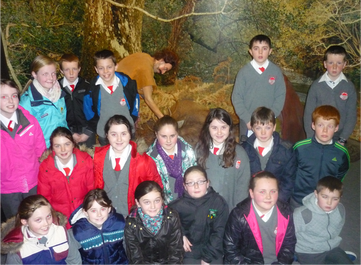 The students received €500 for the school, a celebratory lunch, a variety of gifts and a trip to the Zoo. 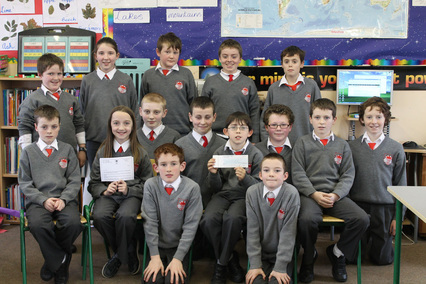 The recent shamrock sale had a final result of €2,222 of which 50% is for the school! A fantastic result. Well done to all students for selling - parents, family and friends for buying and a big thank you to the members of the Parents Association involved who made this fundraiser happen! The money raised will go towards the school gardening project and the organisation of the school Summer Fête. 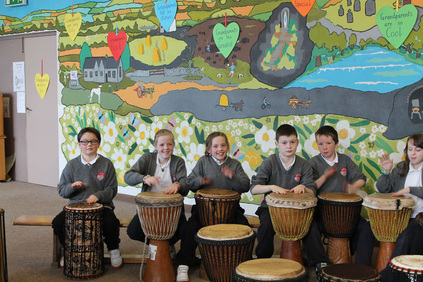 Well done to the Dromclough students who were part of a 600 strong choir of primary school students in Kerry. 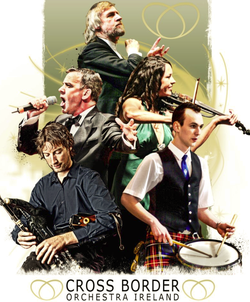 They sang with the Cross Border Orchestra of Ireland on 12 february 2012 at the INEC in Killarney. In total 7000 children from all over Ireland sing in “Peace Proms” with this internationally renowned Cross Border Orchestra of Ireland. The “Peace Proms” phenomenon was conceived and developed by the directors of internationally renowned Cross Border Orchestra of Ireland (CBOI) over the past seventeen years. ”Peace Proms” is a unique and very special music education programme which gives young people the opportunity to perform with a full symphony orchestra at some of the country’s top venues, and work with some of the Ireland’s leading professional musicians and conductors. 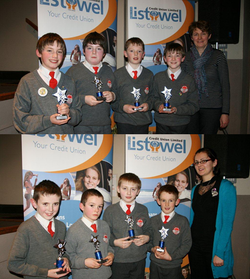 5 February 2012 was again the local edition of the 2012 Credit Union All - Ireland Schools Quiz. This annual event, now in its 21st year has become the highlight of the school calendar. 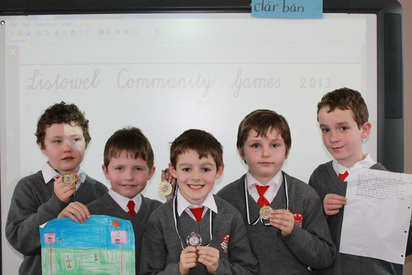 4th class 2nd prize: David O'Connell, Tomás Dillon, Aiden Moloney, Killian Trant, Miss Harrington. 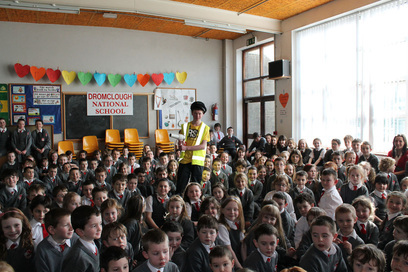 Church collection for Dromclough National School a winner! The church collection, organised by members of the Parents Association, in the last week of January 2012 was a great success. More than €705 was raised, which will be put towards events for the students during the year. 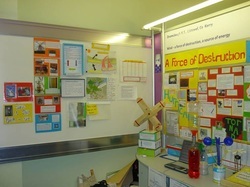 _All of the 6th class of Dromclough NS attended the Young Scientist Exhibition in Dublin last Fri. 13th Jan, where they took part in the Primary Science Fair. Their project was: “Wind as a Force of Destruction and a Source of Energy”, which drew much attention in Dublin from visitors to the Fair. The pupils enjoyed their trip to the Science Exhibition very much, where they also had time to view other projects by primary and secondary school pupils from around the country. The completion of the project, under the direction of class teacher Mrs. K. Trench, was a big undertaking but the pupils benefitted considerably from using their investigative skills, conducting various experiments and from the knowledge they accumulated. In the course of compiling the material they visited Blennerville Windmill and the Pallas Wind Farm. With the assistance of parents they built operational miniature windmills and turbines. Some outside speakers also provided very interesting and up-to-date information. Many thanks for sponsorship received from Now Ireland, Wind Energy Direct and Lee Strand. More images in the photo / video gallery. _Minister for Arts, Heritage and the Gaeltacht, Jimmy Deenihan TD, visited his alma mater, Dromclough NS, on Friday 16th December 2012 to present the medals to the school’s GAA football team and panel. 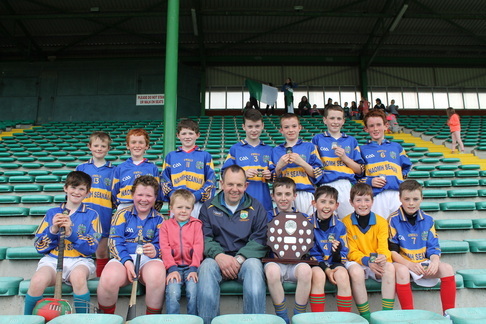 The Dromclough National School team won the North Kerry Final of Cumann na mBunscoil this year. The school are particularly honoured to have a past pupil who is a Government Minister and were delighted to welcome him to do the honours! 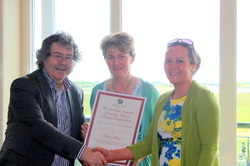 Also included in the photo are Breandán Whelan and John Quilter, team trainers. 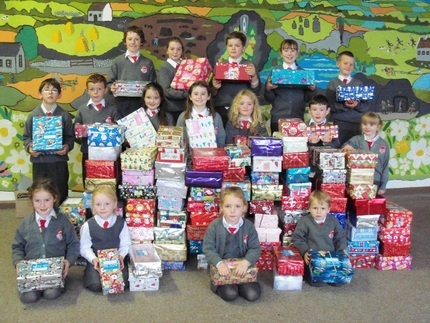 _Thank you to the pupils of Dromclough National School for collecting 124 Christmas Shoeboxes for TEAM HOPE the independent Irish, interdenominational Christian development aid charity, (Irish charity number CHY 14524). Team Hope will deliver the shoebox gift into the hands of a child who has very little in this life, and this gift will bring joy, laughter, hope and dignity. 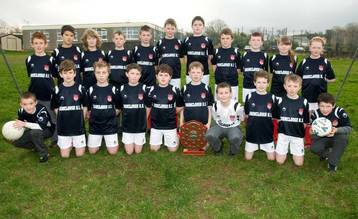 Well done to the Dromclough National School team that defeated Lixnaw NS in the final of the North Kerry Cumann Na mBunscoi competition which was played in Finuge on Friday 11th November 2011. _Dromclough wins Kerry Science Teachers Annual Quiz. 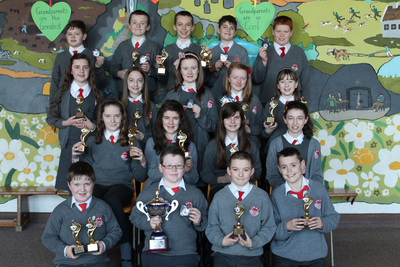 _ Congratulations to all the pupils from the teams of Droumclough NS. The team of 4th class were the winners of the Kerry Science Teachers Annual Quiz in their class section and 5th class and the 6th class both came in second in their respective class sections. Well done!! The quiz was held in Tralee IT on Thursday 10th November 2011. 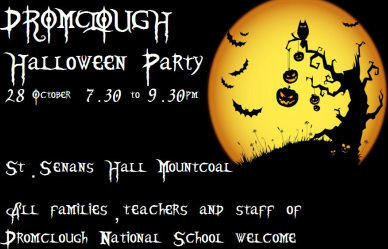 The Halloween Party organised by the Dromclough NS Parents Association was a great success. With more than 300 people the Hall at St. Senans was packed!! Many thanks to all sponsors and people involved in organising this great party!! 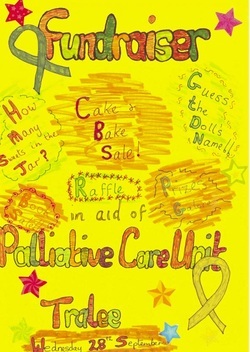 The recent 6th class fundraising week for the Palliative Care Unit at Kerry General Hospital was an outstanding success. 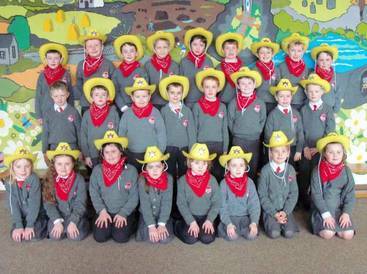 The total amount raised for this very worthwhile cause in one week in the school was a staggering €1,355.00 . Buiochas mór le gach éinne. All the pupils supported the many activities, such as Name The Doll, Guess How Many Sweets in the Jar and many raffles. 5th and 6th class pupils baked delicious cakes and buns for the Bake Sale and finally there was a Used Book Sale. This fundraising initiative for Palliative Care was the idea of 6th class pupil Minnie Thornton in memory of her Nan, Angela Stack who sadly passed away during the Summer holidays.